The plot is based on Austen's novel Pride and Prejudice. Some character names remain the same, while others are changed slightly, using localized names with similar pronunciation (such as Lalita for Elizabeth). Set in Amritsar, the story follows Lalita Bakshi, a young woman living with her doting father and helping him run the family farming enterprise; her mother, who is determined to marry off her daughters to respectable and wealthy men; and her three sisters, Jaya, Maya, and Lakhi. At a friend's wedding, Lalita meets Will Darcy, a handsome and wealthy American working in his family's hotel business, who has arrived in Amritsar with his long-time friend, the British-Indian barrister Balraj, and Balraj's sister Kiran. im conceited, arrogant, and intolerant toward India and Indian culture. At parties and gatherings, Mrs Bakshi's mindless chatter, Maya's kitschy dancing, and Lakhi's uninhibited flirting astonish Darcy and his friends, and mortify Jaya and Lalita. Balraj and Jaya fall quickly in love, but misunderstandings and interference by others drag out their courtship. On a trip to Goa with Darcy, Kiran, Balraj and Jaya, Lalita meets and is attracted to Johnny Wickham, Darcy's former friend, and he validates her low opinion of Darcy. Mr Kholi, a rich, crass, clumsy, and ostentatious Americanized relative , proposes to Lalita. After she turns him down, her best friend Chandra agrees to marry him, much to Lalita's confusion and consternation. When the youngest sister Lakhi runs off with Wickham in London, Darcy and Lalita find the couple and separate them before he can ruin her life, as he almost did to Will's young sister Georgie. Ultimately, back in India for Jaya and Balraj's wedding, Darcy surprises and wins over Lalita by joining in the traditional drumming, showing that he is learning to appreciate Indian culture. The film ends with the double wedding of Jaya to Balraj and Lalita to Darcy, with the two couples riding on elephants down the streets of Amritsar. 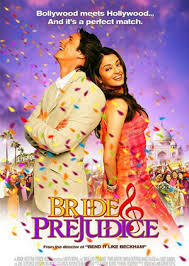 Bride and Prejudice received funding from the UK Film Council with the stipulation that a majority of filming had to take place in the UK. Locations used include Halton House, Stoke Park Club, Turville, and Cobstone Windmill in Buckinghamshire, and Southall, Somerset House, Little Venice, the London Eye, and the National Film Theatre in London. Other locations include the Golden Temple of Amritsar, the beaches of Goa, the Grand Canyon, the Walt Disney Concert Hall in Los Angeles, and Santa Monica Beach. Ashanti sings "Take Me to Love" and "Touch My Body" in the film. According to director Gurinder Chadha, Ashanti's appearance is an homage to the tradition of a celebrity making a cameo appearance to sing an "item number", a song that has no direct involvement in the plot in Bollywood films.